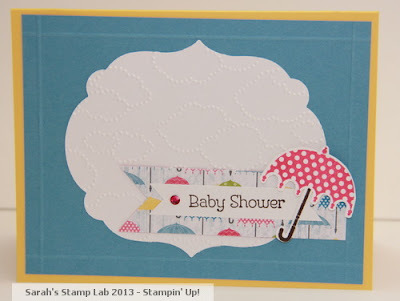 Sarah's Stamp Lab: Final Brides and Babies Card! Today I have the last card from the Brides and Babies Stamp a Stack. Today's card was inspired by the card featured on page 28 of the 2013 Spring Catalog. 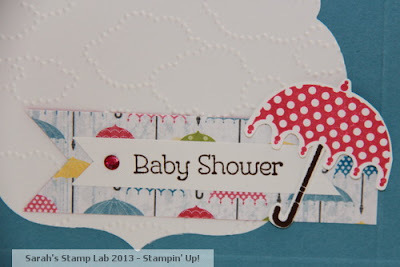 I liked using the Simply Scored tool to add texture to the card stock. Don't forget that the Fabric Frenzy sale begins today. See the Promotions tab for more information on how you can get fabulous SU fabric for 50% off. super cute card!! if i lived closer i'd love to come to your stamp-a-stacks!! Thanks! Even better, I could travel out to you and have a class there. I'm going through HI withdrawal.